Why should handwriting be taught in school? Acquisition of the skill of handwriting is one of the critical skills a child masters in the foundation years of schooling. Yet, as parents, it is often the skill that seems to get the least of our attention. We focus on the amazing miracle of mastering of reading, give so much time to the area of maths, and diligently practise those spelling words. And yet, despite the technological advances of the computer age, the ability to commit knowledge to paper remains the single biggest way in which our children are evaluated at school. And that is why it should be taught in school. Sadly, so often the first time we pay attention to it, is when a problem has developed. By that time bad patterns, which are difficult to remediate, have developed. A good handwriting system taught in school will go a long way to avoid that situation from arising. So many reasons why handwriting is important. Research has conclusively shown that grapho-motor skills in preschool (pre- and early handwriting) have a definitive link to reading and maths abilities in Grade 2. Children who had better grapho-motor skills in their kindergarten year performed statistically significantly better in reading and maths when they were in Grade 2. With this knowledge in mind we cannot ignore how important fine motor and pre-handwriting skills are. Which of us is going to be the one to say we would like to leave out the aspect of learning that research has shown supports the acquisition of reading and underpins maths performance? Handwriting is important and needs to re-gain its rightful place in our techno world. The importance of good, legible handwriting. Many feel that we shouldn’t be paying all this attention to writing by hand when we are living in the technological era. After all, won’t all our children be typing and using iPads for most of their school work? The reality in our country is that, even in the privileged schools, this won’t be the case. However, there is more to this than availability of resources. Research has shown that the specific finger movements associated with writing by hand, activate the memory centres of the brain. When we write by hand, we are assisting our brains with remembering information. These same centres are not activated when typing. So, while the mastering of typing is a critical skill that must not be ignored, handwriting should not, and must not, get forgotten. The importance of good handwriting lies in, amongst other areas, that it is a memory tool. Because of the way the brain is made up and functions, writing by hand assists our children in remembering what they have learned. Why wouldn’t we ensure our children were equipped with a critical memory tool for their journey through school and beyond? Why is neat handwriting important? In the middle school years, children who write by hand, write more, with better syntax and language use, than those who type. Why would we want our children to write less and have their content be poorer? We wouldn’t. And that highlights the importance of a good, legible script. Back in granny’s day there was more time for penmanship lessons and there wasn’t the distraction of the thought that somehow keyboarding was going to take its place. And so daily handwriting lessons were the order of the day, and the importance of good, legible handwriting was never questioned. 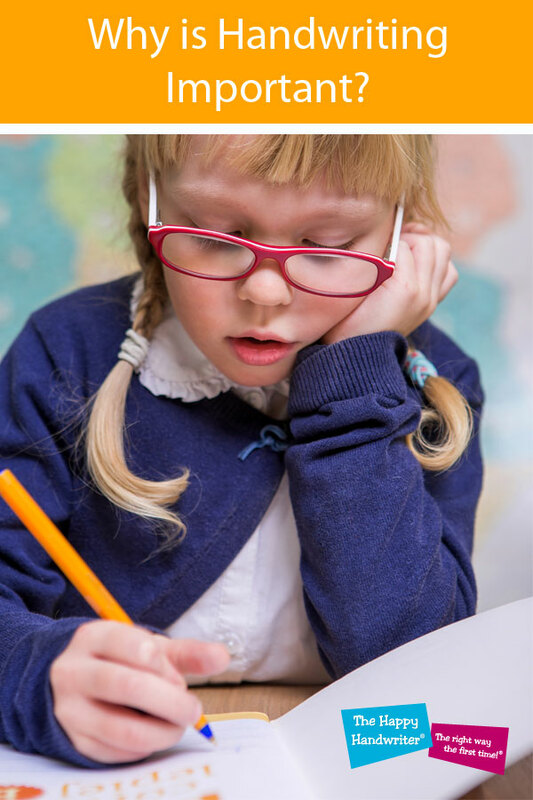 There is a small category of children who have difficulty with handwriting on account of a neurological dysfunction – a disorder in written expression, or Dysgraphia – who do better when typing than writing by hand. But this is a very small category of children and I assure you, you do not wish your child to fall into this category! The research is out there – our children need to write by hand! However, with the advent of early exposure to technology, there is a massive decline in fine motor skills and writing abilities and we need to very specifically address these areas. When handwriting is well-established our children can focus on what they want to write, and not how to write. This is what handwriting automaticity is all about. The handwriting skills are so well-established that your child’s complete attention is focused on what they want to write and how they want to say it, rather than on how to form their letters. The same goes for mathematics. We want our children to be thinking about the calculation and what the answer is, not on how to write the number 5 and which way it faces. The Happy Handwriter is your one-stop handwriting solution that builds the foundations from the bottom up. The system is research-based and is carefully graded to build from the early foundational skills to the mastery of an automatic, legible and speed appropriate handwriting, which will accompany a child from their early schooling through to adulthood. 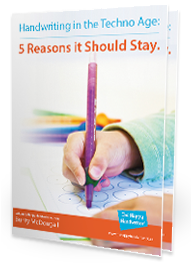 The Happy Handwriter has put your teaching strategies together, from choosing a style, to mastering letter and number formation, in a carefully graded, research-based system that you can follow from pre-school and beyond. It is a complete multi-sensory system that ensures that the brain gets the most information from the touch, auditory, and visual systems so that handwriting can be established in the most efficient way. The system addresses the foundations for both fine motor skills and handwriting, so both aspects are consolidated. But, not only are they addressed, each aspect is carefully graded to build on the next. Being able to write well is a critical skill that our pre-school and foundation phase children need to focus on. But it needs to be fun and it needs to be engaging. Children learn when they are having fun – not when they have to write out boring lines of writing. The Happy Handwriter, while covering the bases for sound handwriting teaching strategies, never forgets the importance of having fun on the way!